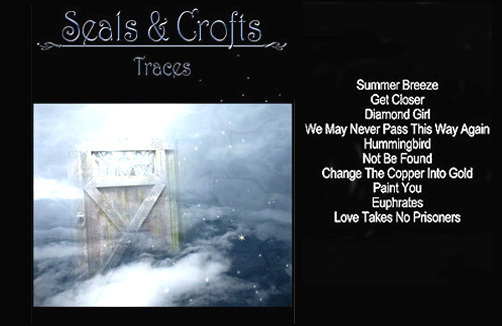 TRACES marks the return of Seals & Crofts after many years apart. To order, go to CDBaby. The duo formed a production company, SCHR Productions, with the primary purpose of recreating most of the old hits. Their children add vocals and a number of session musicians are added to the mix to present a brand new sound. Their trademark harmonies remain strong, and the project purposefully draws upon the "traces" they left behind in the 1970's. Whether it intends to inspire a career revival remains to be seen. More details about the album will be added here in the near future. from the album TRACES (2004). Change the copper into gold. Make me what I am not now. There is a secret I should know. I'd find it but I don't know. Well I got so much inside. I give it till there's nothing left. And the evil one must die, so I can see it through your eyes. I long to see the snow white falcon as it takes flight. A thousand dreams untold. Change the copper into gold. Change the copper into gold. Abide forever here inside of me. Teach me all that I should know. Release the powers of alchemy. Fire and water cannot dwell eternally within this mortal shell. I see the falcon far away. It's calling me to come and fly away. I long to cross the valley of ether. Hear the songs they sing. Sit down on the marble floor. Strike that pose for me once more. Let the time stand still while I catch my breath. You reveal your beauty. I will do the rest. Chorus: I want to paint you in the Northlight. We can do this together. I want to paint you in the Northlight. Keep this moment forever. Step out on the balcony. Wear the golden earrings. Make them dance for me. Let the time stand still. You just be yourself. Now release your emotion. I will do the rest. I want to hold you, look into your eyes. You excite me always. I want to hold you in the Northlight. Keep you with me always. Reach out, let me see you stare. Let your hair surrender to your shoulders bare.